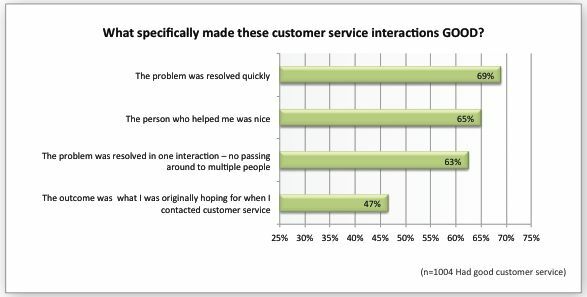 Get customer service staff to act on problems quickly. The sundowner rule we learned for marriage applies equally to business. Fix it and fix it fast! Have a clearly defined time goal in minutes/hours on service problem resolution. Hire nice people. How? Pay attention to the first 30 seconds of the interview. Do you immediately LIKE this person? If not, your customers probably won’t either! Know how many steps a customer has to take to resolve a problem and minimize them. The less steps and people involved, the happier the customer. Don’t just suggest a solution, ASK the customer what they consider to be a fair resolution. Their solution may cost you less and may be easier than what you would have offered otherwise. If you can’t do what they want, at least you know what direction to head for satisfaction. Finally and possibly most important: ASK the customer if they are indeed satisfied. Assuming satisfaction is never a safe road.